Where Your New Companion is Born. too. She is a sweet pup. Thanks! could not decide who would keep the pup. We really do care this much. withers and with an ideal weight of 9 to 15 pounds. the floor requires daily brushing to avoid tangles. clipped short to simplify care, in a "puppy clip". 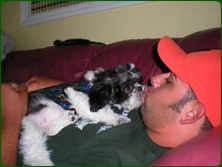 keeps the face clean and dry preventing "red yeast"
from growing on the Shih Tzu beard and moustache. head into a pony tail that sticks up. Very cute. was bred to be a companion dog for Chinese royalty. to be sweet, playful, and trusting as well. 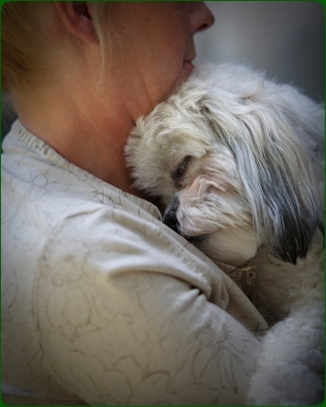 the Shih-Tzu is the perfect companion for most. Hey, don't let a lady go hungry. is she spoiled, we love her to pieces! Another "large dog" lover converted. his comfy blankets on the other side. 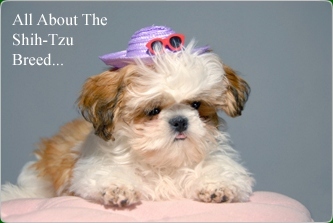 Shih-Tzu's are born into this quaint Upstate New York Village with a magical history. You see, I view each and every gift of a new puppy as magical. They bring so much love to others and, just like Toto, will be there to love and protect you for many, many years of your life. companions. I sincerely hope you give yourself the gift of a companion for life soon. 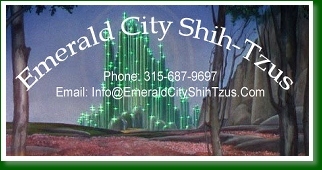 At Emerald City Shih-Tzus, we care about you both. Very much. 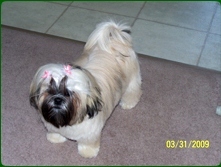 We pride ourselves on being the very best Shih Tzu puppy breeders servicing the Rochester, Syracuse, and Albany areas. 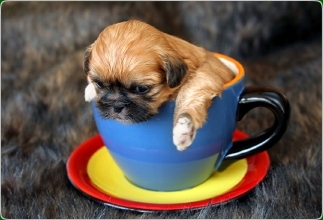 We breed very loving puppies and our Shih Tzu puppies for sale are of the highest quality. 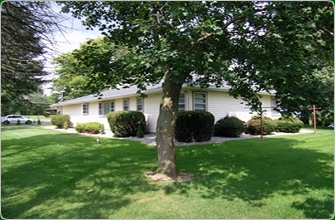 Contact us today and be on your way to completing your family.